From 20 to 29 August this year I spent nine unforgettable days with a group of tourists in the Icelandic highlands. The photo expedition was led by Stefan Forster. This article is intended to give you an impression of the landscape and the conditions of the highlands. 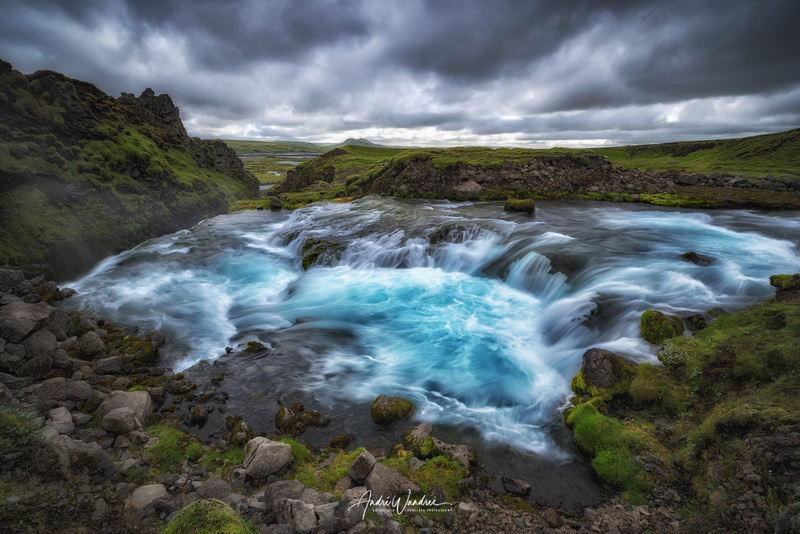 Before the photo trip I received detailed recommendations for everything that is needed for the Icelandic tour, such as: a tent, sleeping mat, sleeping bag, gas cooker, waterproof containers, etc. After our arrival in Keflavik we drove to the hotel. A short time later we went shopping - to buy food for the next days in the highlands. In the evening we enjoyed an excellent meal in the restaurant before we only had ready meals for us in the next few days. After breakfast we started our tour into the Icelandic highlands. We were driving two off-road vehicles. Our expedition leader Stefan arrived a few weeks earlier. With his own SUV he took the route by ferry across the Faroe Islands to Iceland. The other vehicle was rented there. The trucks have 38 inch tyres and river crossings with up to 1.20 meters water depth are no problem. After a few hours of driving along the south coast towards the highlands, the asphalted roads and the tourist streams ended. The highlands are almost deserted (except for some crazy photographers and extreme tourists). 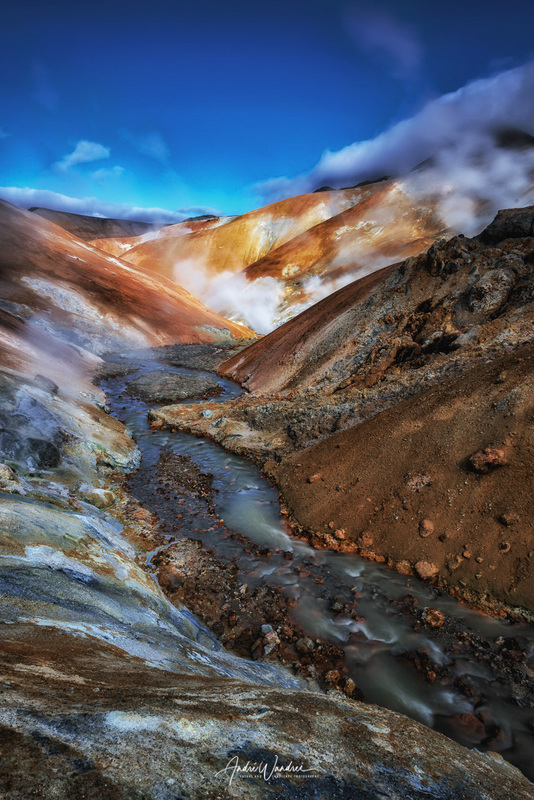 Our destination was the area around "Landmannalaugar" with its hot springs. There, hot water vapour rises from the earth in many places. Like all over the island, Iceland is marked by volcanic activity, whose power and heat is impressively expressed here. There you will find bubbling springs and boiling mud pots. There were endless subjects for taking pictures. Towards evening we reached our campground. The word "campground" is somewhat exaggerated. There was a container with a shower and toilet - the most necessary, but a luxury in the highlands. Nearby was a hot spring where you could swim. We cooked our dinner over the fire and relaxed with a bath in the hot spring. A real experience! We were also rewarded with a great sunset. The morning began as the evening ended: with a breathtaking sunrise and great light. The alarm clock rang in time before the blue hour. I wanted to photograph the hot springs at sunrise. The weather was excellent. The first rays of sunshine, the water vapour in the meadows, a mystical atmosphere was in the air. It just looked amazing. Our tour led us out of the area around "Landmannalaugar" and into the real highlands. For the next few days there was no internet, no shower, no toilet and no comfort. We cooked our food over the fire and drank water from rivers. The landscape changed. Gradually the yellow-red mountains changed to dark rocks. 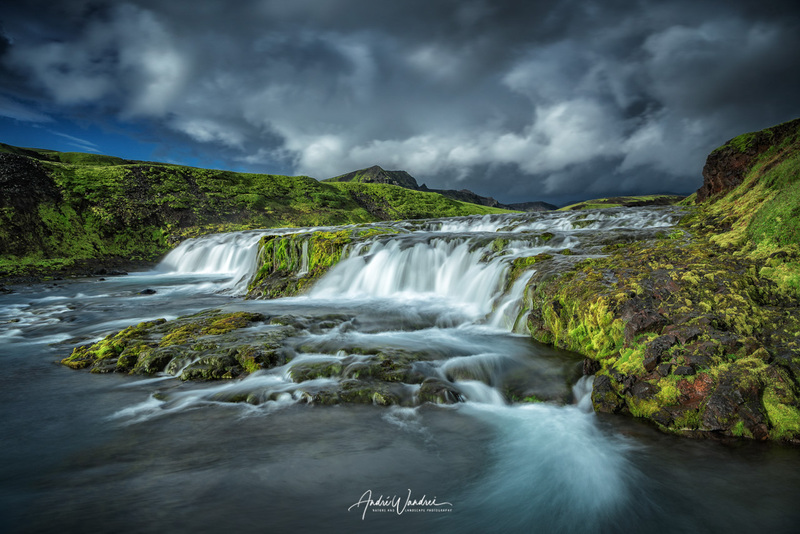 Black sand, rugged lava rock and mountains covered with bright green moss as far as the eye can see. The remains of past volcanic eruptions. Actually, you could have stopped every ten minutes to take a picture. Behind every mountain top the landscape looked impressive and different than before. In the afternoon, however, the weather deteriorated noticeably. We stopped in the middle of the mountain. Next to a meadow, two rivers meandered through gorges. Nearby was a waterfall. Here we pitched our tents. I tried to take some good pictures but the weather was too bad. So I spent my time exploring good photospots for the next morning. There was a storm that night and it rained like rain from buckets. But my tent stood like a bunker. The next morning the weather improved and I could take this photo. I was standing in the river, waiting for the right moment. For one minute the sun was shining and lit up the waterfall in the morning light. We continued our journey through the highlands. Over hills, ash fields and rivers. There are ash fields and areas of black sand stretching over a length of 40 kilometres. We spent our lunch break at a rocky outcrop at the foot of a 400 meter high mountain. But the rainy weather didn't stop us from hiking on the mountain (it was actually more climbing than hiking). The view up there was simply stunning. Despite the wind and drizzle, some impressive photos were taken on top of the summit. The descent was difficult in pouring rain, but we mastered the challenge! On our further journey we stopped at many places and took pictures of the mossy mountains of the highlands. Unfortunately, a damage to Stefan's truck happened that day. When driving through a river, the right front wheel collided with a rock. The wishbone was bent. Without a workshop, the damage could not be repaired. So something had to be planned and improvised. We spent the evening near a hut in the highlands, while Stefan alone had to drive three to four hours to the next workshop. The next day around noon he was back with the repaired vehicle. Such incidents can happen even with the best truck in this difficult terrain. We continued our tour through the highlands. Wherever there were good spots to take pictures, we stopped. In the afternoon we walked to a nearby waterfall. Above the waterfall there was a beautiful view over the highlands. A few metres further on, the river fell down a ravine. Unfortunately, there was no way into the gorge for us. I would have liked to have photographed the waterfall from below. But it wasn't meant to be. We continued our tour through the ancient Iceland. The size and expanse of the highlands is fascinating. 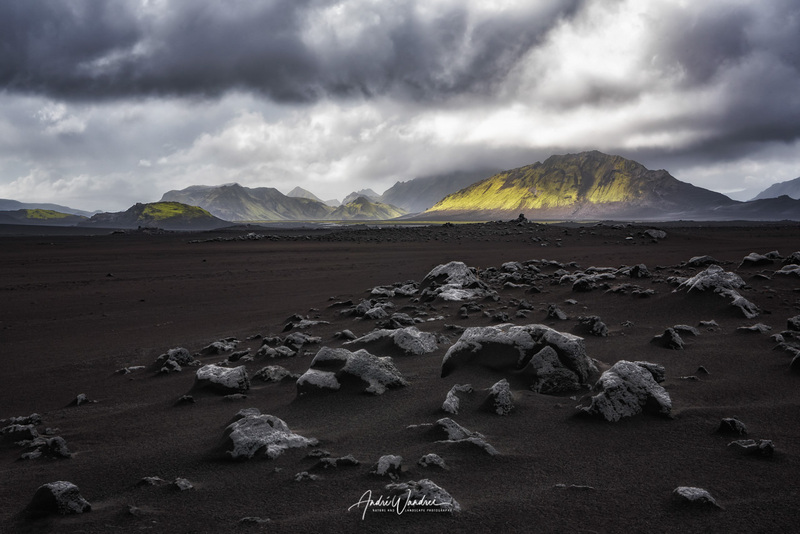 Huge fields of black sand and lava stone alternate with moss-covered mountains. In between, rivers flow that have dug their way through deep gorges. I think you could spend several weeks, even months, there and you wouldn't have seen everything. In the evening we camped in a remote spot between two lakes. The weather improved and at night it was clear as a star. This is quite rare in Iceland. Unfortunately, there was no aurora borealis. That would have been the jackpot. Our group of travellers headed back to the south coast. After a journey of several hours we reached the glacier lagoon "Jökulsarlon". From the glacier of the same name huge ice chunks break off again and again, which then drift on the river into the sea. The icebergs are always a worthwhile motive. The beach is made up of black sand on which the ice chunks, washed by the waves, lie. Set right in scene, you can take great photos of the ice chunks. In the evening we arrived at our hotel in Höfn. Finally it was possible to shower again and dry the clothes and equipment properly. For dinner we had a good time in the nearby restaurant. We drove along the south coast. We stopped here and there to take pictures. 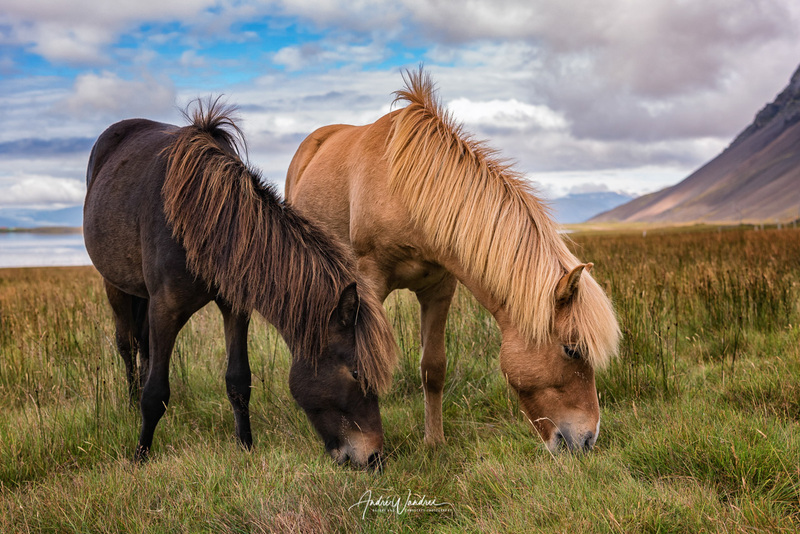 A few Icelandic horses were also used as motive. On the south coast you can clearly see how many tourists are in Iceland. The tourism in Iceland has unfortunately increased exorbitantly. Ten years ago, they told us that there were still 80,000 tourists a year. Today, it's almost 1.5 million. In the afternoon we paid another visit to the icebergs on the beach. 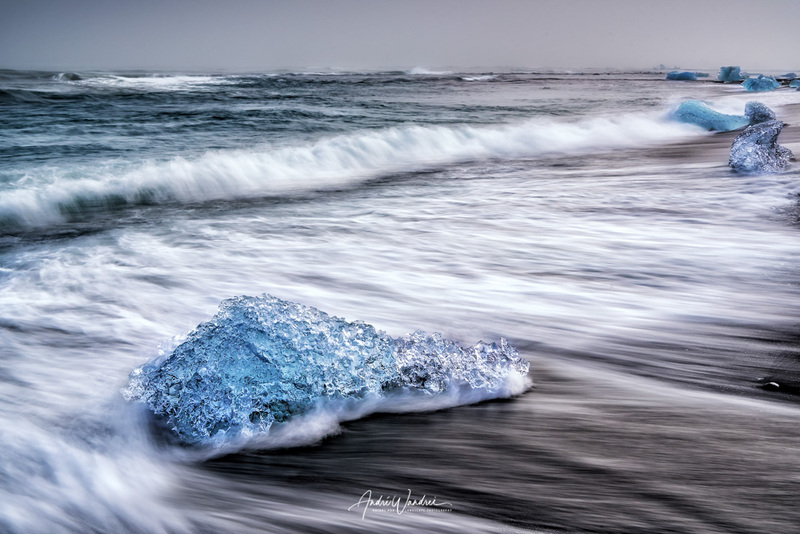 Especially the glacier lagoon Jökulsarlon, the river on which the icebergs drift towards the sea and the beach are the contact points for hundreds of tourists. I felt like I was in a parking lot outside an amusement park. In the evening we went to a remote place near the glacier lagoon and set up our tents there. We were hoping for aurora borealis, but at night clouds rose. Especially the icebergs that float in the water are said to look incredibly good in aurora borealis when the light is reflected in the water. We drove along the south coast back to Keflavik. At noon we stopped at the cliffs near Vik. From up there you have a great view over the sea. If you are lucky, you can take pictures of puffins. For a year now, it has been forbidden to drive up there by car, as this road has been closed for safety reasons. On our way we also passed the famous Skógafoss. In front of the waterfall tourists were again busy. Unfortunately, there was not much to see for us on this day, because we had to cover the 450 kilometres to Keflavik and so we spent the time in the car. There are no motorways in Iceland, of course, and progress is far from being as fast as in Germany. In the evening we went to the hotel and later on we enjoyed a delicious dinner in the restaurant. Generally speaking, Iceland is a very expensive country. The prices in the restaurant are very high, especially for alcoholic drinks. Early in the morning shortly after 7:00 o' clock our flight went back to Switzerland. My conclusion: Iceland is and remains a breathtakingly beautiful country full of natural wonders. Unfortunately there are many tourists, especially on the south coast and in summer. Most of the most beautiful landscape photographs are taken in the mornings or evenings and at these times it is also limited to tourists. The highland is extremely impressive and offers an eldorado of motifs for every landscape photographer. 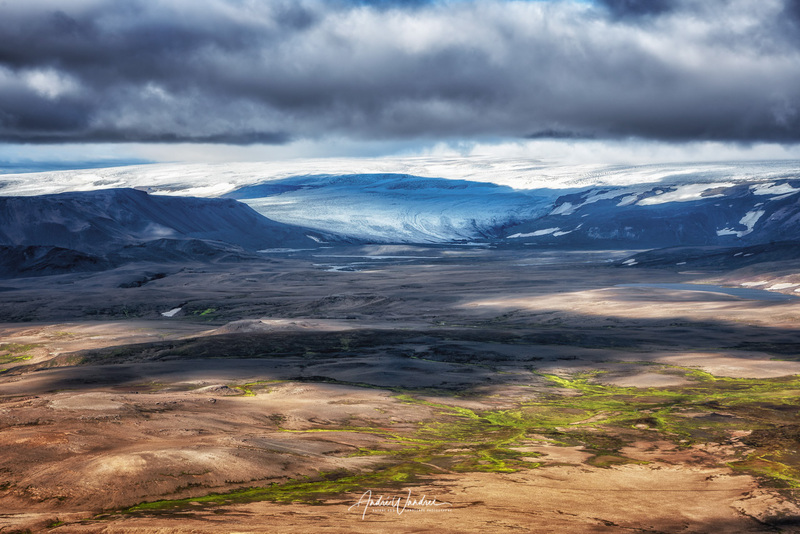 From a photographic point of view, Iceland is an absolute highlight.